Yesterday in Sydney many were reading their morning papers and digesting the news that the Federal Education Minister Christopher Pyne was lying when he said that the NSW State Government was “on board” with his so-called education reforms. While some were coming to terms with more lying from the new Abbott led Coalition government, others in Sydney were making last-minute hasty plans to reschedule their lives which were suddenly thrown into turmoil. The NSW Education Minister Adrian Piccoli, who some of you may remember for signing the pledge to guarantee no cuts in TAFE funding during the election campaign that saw the Coalition form government in NSW made another decision this week. Mr Piccoli ignored his campaign pledge and as many will remember shortly afterwards and slashed 1800 staff and a huge number of services from TAFE as part of the Coalitions $1.7 Billion education cuts. This week the decision to make even more cuts was made. On Monday those who had enrolled at Hornsby and Northern Beaches TAFE for Diploma and Advanced Diploma courses in Visual Arts found out that the cuts weren’t quite done with yet. Those unfortunate enough to be enrolled in these classes were told by phone this week that the decision had been made to cancel these courses altogether at the TAFE in which they were enrolled. This news came less than one week before classes were due to commence. Is this what the Department Of Education thinks is fair warning? Students were understandably quite distressed at this last-minute change to their education plans, and rightly so too, a few days is nowhere near enough notice for a decision like this. Students from Hornsby were informed that they could enrol to do these courses at Meadowbank TAFE when phoned by their teacher. What students then discovered was that not only had the course at Meadowbank already started a week earlier, but that it also operated on completely different days. For those juggling part-time or casual employment this is of course a major drama as they have already organised employment for the days they were not going to be at TAFE. Many now face the decision of continuing their course and finding new work, or not furthering their education and continue to earn a wage. For one of the students from Hornsby who is in a wheelchair there is the added humiliating difficulty of no disabled access or lift to the Visual Arts section of Meadowbank TAFE which is on the second floor. Given the short notice and understandable anger of the students involved I contacted Education Minister Adrian Piccoli’s office for comment. I received a response from a senior media officer that cited low enrolment numbers for the courses at Hornsby TAFE. Although no numbers for Northern Beach TAFE enrolments were supplied, Piccoli’s office stated that 34 students had been enrolled at Hornsby in these courses. However sources from Hornsby TAFE speak of more than 80 students enrolled in these courses. These were students enrolled in visual art classes such as drawing, painting, print making, and even photography. Those who know Sydney and the Central Coast area will understand what a ridiculous notion it is to expect someone to travel from Hornsby to these locations, let alone the Northern Beaches Campus at Brookvale. From Brookvale to Ourimbah which is on the NSW Central Coast is 82.8kms drive, most of it through city traffic, via public transport I would hate to even imagine the ordeal involved. It sounds like more sackings are on their way from that statement, more broken promises from the Minster. For those seeking to further their education by doing these courses the more expensive Option B would have been to seek these courses via private colleges. It is unfortunate however that on top of the added expense, given the late notice most enrolments for these courses have either closed or classes are already full and alas there is no option C.
Ryan Park raises a point that really highlights the consideration and level of community care that has gone into this decision. The sooner the Coalition understand that these are not just numbers on a spreadsheet, these are real people with real lives and real responsibilities the better off we will all be. Those parents out there who live in the real world know the struggle, the effort and the expense of finding good child care. It would seem those in the Coalition wouldn’t even give those real world issues a passing thought. For those left high and dry by a government who cares less about education than Gina Rinehart cares about minimum wage, I hope you manage to reshuffle your lives and complete your education. For those wondering why this had to be rushed through and the numbers couldn’t have been re-evaluated for a decision next year so that appropriate notice could be given to students, I may have an answer for you. There is a state election in NSW next year. White Ribbon Day comes along this weekend, on the Sunday 25th to be exact, and I hope everyone takes a minute or two to stop and consider what it is all about, particularly the men. For those who don’t know White Ribbon Days origins or what it is all about you can read more about it in my earlier post “I Swear”, but for those who couldn’t be bothered, White Ribbon Day is a day in which we wear a white ribbon to show our contempt for violence against women. I won’t be writing a great deal on this post, as I think a picture tells a thousand words, but what one thing I will say is that hitting a woman does not make you a bigger man, in fact quite the opposite. It is important that as a society we send a clear message that violence against women will not be tolerated. In Australia we have seen a number of celebrities commit violent acts against women, and I don’t really understand why we continue to support them. Designer Wayne Cooper for example. Sarah Marsh, Coopers defacto wife of 12 years came forward with allegations of abuse. Cooper has allegedly hit her in the mouth, splitting her lip, and threatened her with a knife, holding it to her throat and threatening to cut her fingers off. All this after she had just recovered from cancer surgery, what a nice guy. Yet women still buy his clothes, his rags are still available at Myer “My Store”. Maybe Myer’s next ad campaign could have Jennifer Hawkins made up with a fat split lip and a bruised face, bloodstains down the front of her clothes. Then again, maybe they should just de-range all of Coopers rags. We love our sport in Australia, we love our footy in particular. Games like Rugby League do so much to promote a healthy attitude towards women. Who can forget the 4 Corners episode that turned the game on its head in 2009 with allegations of a culture of sexual abuse? There are some players who are genuine exceptions and do promote a healthy attitude to women, players like Hazem El Masri, and Nathan Hindmarsh, who is a White Ribbon Day Ambassador, and I hope these guys influence others. Meanwhile the NRL code supports bastards like Greg Bird, who was granted bail by the courts, and promptly took off to captain a rugby team in France, after allegations that he beat his girlfriend and then glassed her in the face. Codes like the NRL may see the potential in men who permanently scar the faces of women with broken glass, I don’t. The number of assaults on women by NRL players are too many to count, but here’s a link to a story on the Roosters Anthony Watts after he was alleged to have beaten up his girlfriend. At what point will the code make a stand that isn’t just a soundbite or a headline to attempt to undo the damage caused by a player? It is about time that something was done to put a permanent end to this behaviour. Actors like Matthew Newton have also made headlines for all the wrong reasons. I know that there are issues with mental illness in Matthew’s case, but in my mind the jury is still out as to whether that is an adequate excuse. I genuinely hope he is getting the help he needs, and I also hope that Brooke Satchwell and Rachael Taylor received the support they deserved. Although White Ribbon Day is about violence towards women, we also need to remember that not all violence involves actually striking someone. Threatening behaviour and physical intimidation of women are just as gutless, and just as bad. In fact any intentional act that makes a woman fear for her safety is an act. Pushing, shoving, or hitting is quite obviously violence, however raising your hand as if to strike a woman, cornering a woman, physically blocking her path are acts of violence. So too are punching walls on either side of a woman’s head, or making threatening gestures and comments towards a woman. We live in a society that is tolerant most of the time. However violence towards women is one of the things that we should never tolerate. I hope you will join me in making the pledge, and supporting White Ribbon Day. To find out how to do your part, check out the website here. Firstly, I apologise for the title, and trust me I’m no Boyz 2 Men fan, the reason for this title will become apparent in the video at the end of the post. However, I make no apologies whatsoever for pushing this cause. Over the last couple of months we have been hearing a lot about abuse, and misogyny, and despite these being ugly subjects, I think it is good to bring these subjects to light. It is only by acknowledging and then working together that we can have any serious impact on reducing the statistics of these heinous acts. Coming up on the 25th November is White Ribbon Day. White Ribbon Day is a day that we campaign to end the violence towards women, and I hope all who read this will support the cause, both women, and particularly the men. Please take the time to check out the White Ribbon Day website, and also you can click “Like” on the White Ribbon Day Facebook page, you can even follow them on Twitter here. This is a day that there should not be any debate about, it should have bi-partisan support. Whether you are married or single, gay or straight, one thing we all have in common, no matter what your background, as we all have a mother. I’m not going to try and tell you how White Ribbon Day came to be, or to tell you its significance, I will leave that to someone far more qualified than I. Below is the Hansard Transcipt of a speech made by NSW Labor MP and MLC, The Honorable Peter Primrose on November 13th. Peter is a member of my local Labor branch, a tireless worker for many causes, a strong voice for a State that needs one, I’m proud to say a mate, and he is also an Ambassador for White Ribbon Day. On the afternoon of 6 December 1989 a young man walked into a university in Montreal, Canada, armed with a semiautomatic rifle and a hunting knife. He entered a classroom, separated the male and female students, stated that he was “fighting feminism” and opened fire. Six women were killed in that classroom and a total of 14 women were murdered by him that day. His actions traumatised a nation and highlighted the issue of violence against women around the world. In 1991 a handful of men in Toronto launched Canada’s White Ribbon campaign, an annual violence against women awareness raising event held between 25 November and 6 December—the anniversary of that Montreal massacre. Eight years later, in 1999, the United Nations General Assembly declared 25 November the “international day for the elimination of violence against women” with the now iconic white ribbon as its symbol. White Ribbon Day began in Australia in 2003 as part of UN Women and formally became a foundation in 2007. It is now Australia’s only national male-led campaign to prevent violence against women. White Ribbon believes in the goodness of most men. It believes that good men reject violence against women and are willing to act to prevent it. White Ribbon believes in the capacity of the individual to change and to encourage others to change. The campaign is focused on primary prevention. In other words, it works to change our culture to stop the violence before it occurs with activities in schools, workplaces and the broader community. Violence does not refer just to physical acts; it refers also to non-physical acts including emotional, verbal and financial abuse, sexual discrimination and forced isolation. Every year White Ribbon runs an awareness campaign about the issue of violence against women and the role men can play in preventing such violence. In 2012 White Ribbon encourages men to stand up to violence against women with the knowledge that thousands of good men have resolved to do the same. White Ribbon’s new campaign highlights that men can challenge their mates and others in a way that does not endanger their own safety, knowing that there are many good men who support their actions. The chain starts with good men standing up and letting the perpetrators know that violent attitudes and behaviour towards women are never acceptable in any circumstances. Violence against women is a grave problem. One Australian woman is killed every week by a current or former partner. One in three women over the age of 15 report physical or sexual violence at some time in their lives. One in four young people have witnessed violence against their mother or stepmother. Two-thirds of women who experience domestic or family violence are in paid work. Domestic and family violence is the major cause of homelessness for Australian women and children. According to KPMG, violence against women and children cost the Australian economy $13.6 billion in 2009 and if no action is taken to prevent it that sum will increase to $15.6 billion per year in 2021. I am proud to be one of the many White Ribbon ambassadors. The violence perpetrated by men against women must stop and it is up to men to stop it. I know I’m probably preaching to the converted, but I hope you all support this cause. Please share it, post it, tweet it or whatever, just spread the message around. Monday nights are my big night, all 5 of these shows are on. I can just stretch out on the couch with some trackie daks on, and make myself comfy. What I like about Q&A is that no matter which way you lean politically, the guests are usually good, and each get a fair hearing, even obnoxious ones like Mirabella, Brandis and O’Dwyer. What has dismayed me this season, is the number of musical guests that play a song at the end of the show. Has the channel 10 board of directors suddenly taken over the ABC? Clearly she was only there to advertise her latest album on a channel that doesn’t allow advertising. I am reasonably sure most people watch Q&A for the discussion and to see panellists who want to be involved with the audience and the discussion. The time allocated to her could have been given to more discussion, and her seat could have been given to someone who may have actually given a toss…. I have yet to meet someone who says they are looking forward to seeing what performance is at the end of Q&A. Do you know why? Nobody cares about the performances…. This is not the first time this has happened either, there have been a few performances this year. What is coming next? Are we going to see Tony booted out and the show hosted by Rove, or Kyle Sandilands? Please understand, I am not having a shot at any of the performers, or their talent. Q&A is true reality television, and I’m just trying to vote the performers off…. I hope the producers of Q&A hear my plea, and I hope they hear it before Young Talent Time includes political discussion between songs. The title of this post is the title of a Beastie Boys track. For those who were unaware, Adam Yauch, MCA of the Beastie Boys died yesterday from cancer. An influential band, and one of my favourites, he will be sorely missed. I am a bit of a music nut, and I thought that I would share with you what I thought were the funniest/cleverest album titles ever…. The albums listed, although some are rather brilliant, are not all albums I would recommend buying. I take no responsibility for any dud purchases…. Dave Grohl, many of you know him as the frontman for the Foo Fighters, some of you know him as the drummer from Nirvana, if you don’t know him, you may as well stop reading now. Dave Grohl was a member of one of the most influential bands that the world of rock music has ever seen, Nirvana. They changed the course of music, and influenced a whole new generation of musicians. Since then Dave has been the frontman for his band, the Foo Fighters, as well as some other side projects with other well known musicians, such as Them Crooked Vultures, and a drumming stint with Queens Of The Stone Age. The Foo Fighters are kind of like the Britney Spears of rock music. By that I mean they do a few catchy singles but have yet to master the art of producing a good album. They have a formula that they stick to pretty religiously musically, and as a band, in my opinion, are yet to take a risk. Dave Grohl for years has tried to distance himself from Kurt Cobain, the singer/guitarist and songwriter from Nirvana. Kurt was a troubled genius, and no matter what Dave does now, it will never have a fraction of the impact Nirvana had on the music world, so I can understand the need to distance himself from Kurt and Nirvana. Dave would no doubt want to be seen of worthy of success in his own right. There was a joke that went around after Kurt Cobain took his own life, it went like this… “What has 4 legs and works at McDonalds?” The answer, “The rest of Nirvana”. With that kind of attitude going around, it is no wonder that Dave did not want to talk too much about Kurt in interviews. Even after the Foo Fighters were a success, questions about Kurt still dogged him wherever he went. One of the things I always admired about Kurt, was his attitude towards fame and money, he just couldn’t give a toss about it. In fact he would often go out of his way to try and receive less airplay, and to do things to actually lose fans that he considered “rednecks”. I was glad to see that Dave seemed to keep this attitude going, not being gimmicky, or having silly props for a live show, a real back to basics approach. It was also refreshing to see that he was not trying to make money, or gain extra attention by using Kurt Cobain’s name. Below is a picture of the cover of the recently released authorised biography of Dave Grohl. 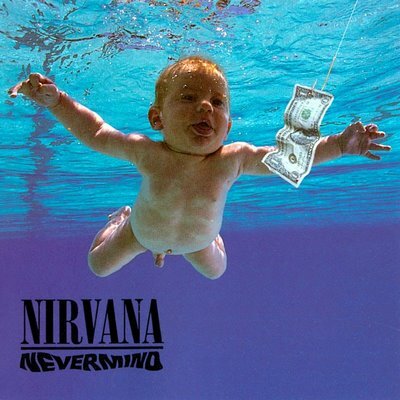 It mentions Kurt on the cover. There are two types of people in this world that I despise, Conservative Politicians, and hypocrites. Don’t think for a minute that I was not a fan… I have the first 3 Foo Fighter albums, and have seen them live twice. But the cover of this biography has changed all that. Using Kurt’s name on the cover may help you sell a few extra copies, I’d even be interested in reading it myself. But I won’t buy it on principal. If your name isn’t strong enough on its own to warrant a biography, don’t release one. 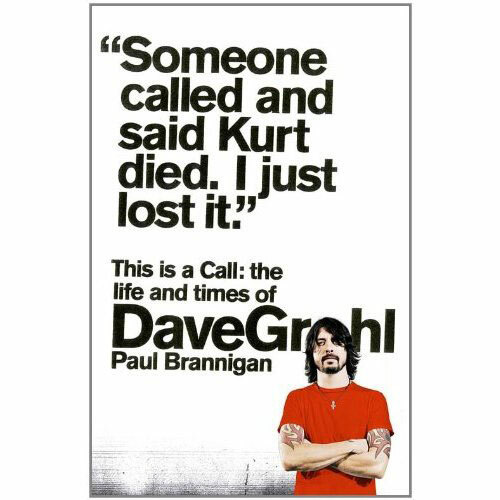 The fact that the line about Kurt that Dave approved for the cover also relates to Kurt’s death, makes me want to puke, as it is clearly using Kurt’s death to sell more copies. The first time I saw the Foo Fighters was one week after they released their first album, at the Reading Festival in the UK. They were headlining the second stage on the second night. Around 12,000 people tried cramming into a tent designed to hold 6,000. The show had to be stopped several times to allow paramedics in to pull out those who had passed out from the heat. It was a memorable gig indeed. The other thing I remember about that gig, was that none of the audience were there to see the Foo Fighters. They were all there to see the drummer from Nirvana’s band. Judging from Dave’s biography cover, that’s how he’ll always be remembered.